Fatgirl Hedonist: Evian's Instagram Challenge and Last Minute SOBEWFF tickets! Evian's Instagram Challenge and Last Minute SOBEWFF tickets! For everyone going to the events or wishing they could go to SOBEWFF, you can still participate via Instagram. SOBEWFF’s official water sponsor, Evian Natural Spring Water, is partnering up with Chef Richard Blais for an interactive takeover of the @evianwater Instagram account to provide the social community with a behind-the-scenes view of the epicurean festival with a twist. 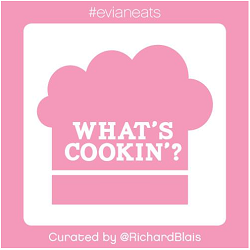 Beginning February 15, 2013, the week leading up to the South Beach Wine & Food Festival, Chef Blais will kick off Evian’s #evianeats Food Photo Series on Instagram, where a fun, food theme will be posted once a day on the @evianwater Instagram account. Instagram users are invited to upload photos of their own culinary creations and dishes via Instagram and Twitter (@evianwater) using #evianeats, and evian will re-post a selection of their favorite photos across the interwebs on Twitter, Instagram and beyond.